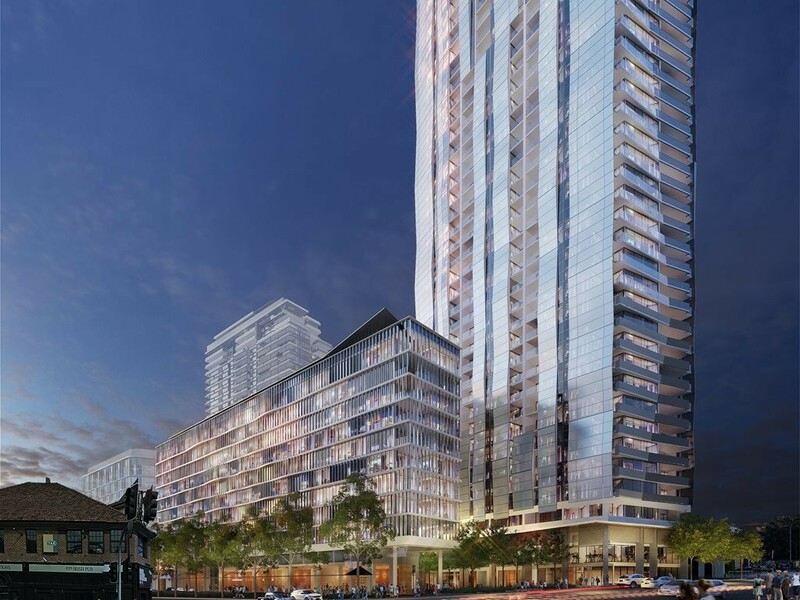 DA approval has been given for the redevelopment of Parramatta Gateway which will see a $876 million mixed-use development on three prime sites built on the iconic ‘Auto Alley’ on Church Street, at the southern edge of Parramatta’s CBD. Won by AJ+C won in a competition run by The Heartland Group along with Turner and Oculus as the landscape architects, Parramatta Gateway will symbolise Parramatta’s unique location, culture and historical character. Comprising three towers up to 42-storeys in height, the northern residential tower has been scaled and shaped to create a distinctive landmark gateway to the new Auto Alley precinct. The developer Dyldam has been quoted as saying that it wants to create more than 750 apartments and some 40,000sqm of retail and commercial space. A broad colonnaded pedestrian plaza lined with shops, cafes and eateries will connects the site from the corner of Church Street to the new park, with water features referencing Parramatta’s location at the ‘meeting of the waters’, public art and extensive landscaping. The facade glass pattern and colour will have “vertical, light coloured glazing at the top, representing the calm ‘headwaters’ of the Parramatta river, darkening in colour and steadily increasing in wave pitch towards the bottom of the tower, representing the deeper, rougher waters of the harbour and ocean beyond”, says AJ+C. The middle tower will be angled and shaped to allow sunlight into the pedestrian plaza and park, and features sweeping balconies expressing the sandstone geology that is to be found in the materials of Parramatta’s historic buildings. There will also be a podium linking the two residential towers with outdoor areas on top, complete with landscaping, pool and spa for residents. There will also be a range of urban enhancements around the location of the towers such as road widening, tree planting, new bus and cycle lanes and a 4.5 Star hotel that will eventually transform Church Street into a boulevard with contemporary art and event spaces. Completion is set for 2022.